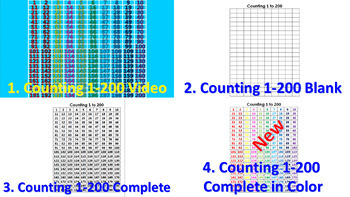 Have your students practice counting on a 200's chart. This video is in the format of an MP4. This will play on your computer or you can upload it to your ITunes account to play on an IPad. Students can practice daily this fun and colorful counting activity. We hope you have fun with this activity. This video has almost 50,000 views! Yes, this video comes with my voice as I speak each number from 1 to 200. Students can now follow the along with their own two hundreds activity sheet. 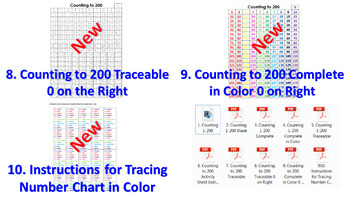 We have also included a blank two hundreds chart in PDF document. 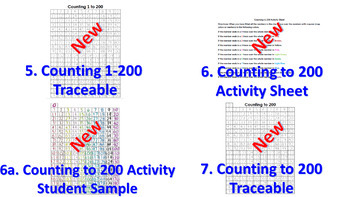 Also, you will get a completed two hundreds chart in PDF document for you to hand out to your students to study. Students will enjoy the challenge to complete the blank two hundreds chart. This has been student tested in several elementary classes. By popular demand we have included a 200's chart activity that has traceable numbers for students who are struggling with their numbers. We have also included instructions on how to color their completed chart to match the colors on the video. We have also updated the chart to include the number zero. We even put a real student sample of the chart completely colored. Please download the preview to see all the activities you will get!